Apologies to everyone here for a way off topic post. A few days ago an owner of two Welsh Corgis had to rush their two dogs, one almost 5 years old and the other 7 months old, to the vet. As it turned out their neighbor had poisoned the two dogs by throwing rat poison over the fence. The dogs consumed the poison and both got very sick. 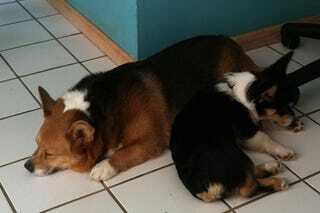 Unfortunately the older Corgi was to weak to fight the poison and had to be put down on the 15th. The puppy is still recovering and may be able to make it, however the vet bills are growing. The owner has started an Indiegogo page for any assistance they can get for covering the medical bills. As a corgi owner myself this story hurts me, knowing there is a person out there willing to hurt innocent dogs like this and I can't help but think what being in this position would be like. However, I am not in the financial position to help them right now but I am doing what I can to help by sharing this story. If you can help contribute to the costs please do so. If you can't but want to let others know please share this story. Anything can help. This morning the total raised was about $300 at the time of this posting it was $661.